Select the data group whose data will be displayed in the tree structure. Opens a dialog where a filter can be set up. Here, select a field that contains unique values that allow an individual tree node to be identified. This does not have to be the primary key of the data group. Here, a field will be selected where the tree control will automatically enter the ID of the superior folder, as soon as a new folder is created in the browser. 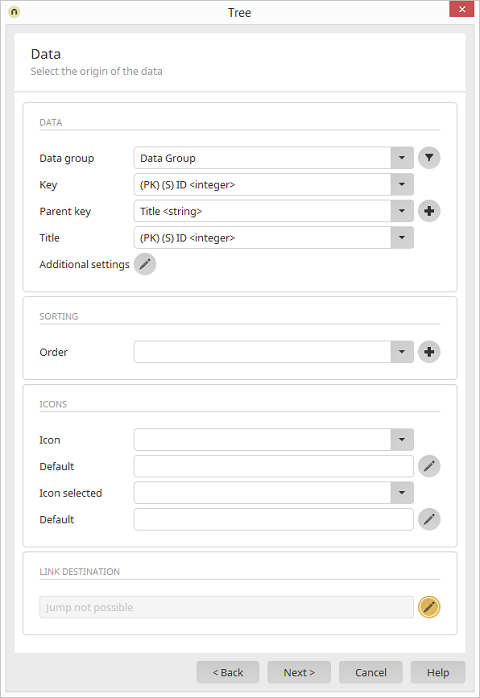 Opens a dialog where a new data field which contains unique integer values for the identification of data records can be created in the selected data group. Select a field in here that contains the title of the folder. Opens a dialog where the presentation of the tree can be limited to subareas. The field that you enter here defines the sorting of the folders that can be found on the same level. Opens a dialog where a new data field, which will be used for the sorting of the entries in the tree, can be created. Please do not change the values that are to be connected here with the key, the superior key, and the order. These values will be automatically managed by the tree control when new folders are created or existing folders are changed. The functionality of the tree control cannot be guaranteed if this occurs. Here, select the data field that contains the desired images. The image that you enter as the default will be used when a folder is first created. Opens a dialog where you can upload an image of your choice. An image data field can be selected that represents folders that are currently selected in the browser. The image that you enter as the default will be used when a selected folder is first created. Entries composed in the browser will be stored in the individual folders. These entries can be further edited at any time.